Duke has licensed technology developed in its engineering research laboratories to a spinoff company looking to help transform carbohydrate feedstocks into high-value products. From biofuels to fragrances to beer, microbes are responsible for making a wide variety of everyday products. While some are merely doing what they’ve been doing for thousands of years, others have been engineered to be more efficient or to produce specific high-value products. And the companies that harness this potential are always looking for ways to make more and spend less. A typical microbe’s array of life processes is extremely complex, however, and finding the best combinations of genetic and environmental factors is a tall order. Other companies are developing methods to test variables as fast as possible to find better microbial designs, hoping to hit on a winning combination. 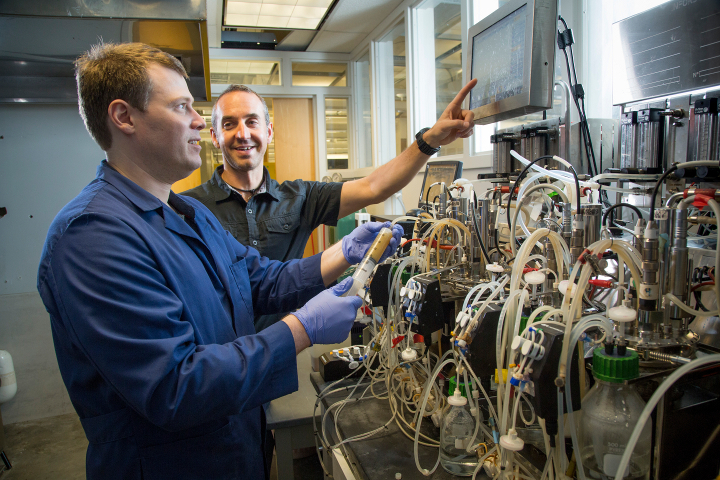 The solution developed by Mike Lynch, co-founder of DMC, and assistant professor of biomedical engineering and chemistry at Duke, is to greatly reduce the complexity of the problem in part by separating the microbes’ growth phase from their production phase. The approach is much like that of the farmer who prunes an orchard to encourage trees to direct their energy toward producing fruit rather than growing branches. By culturing microbes at industrial scales as quickly as possible and then genetically shutting down growth and extraneous metabolism, Lipscomb and Lynch can channel all of the microbes’ energy toward product formation. Not only is this more efficient, it reduces the complexity of a cell’s biochemical reactions to a design space of around 50 nodes . . . rather than 1,000,000,000,000,000,000,000,000.